This item is for Export only cannot be use in Singapore as there are no 2G network. What is Securitex GSM universal controller. SECURITEX TWCT22 product which allows user to monitor and control your remote units/equipments. This product which not only enables remote monitoring and control but also sends you SMS/Email in case of alarm conditions. TWCT22 is the product which would full fill these needs in the most effective and economic way. TWCT22 is an advanced yet simplified Remote Terminal Unit. Taking advantage of the reliable, widespread GSM networks and the supported GPRS service, TWCT22 becomes a remotely accessible unit from any part of the world. Using an embedded feature rich web server interface, user can configure various parameters of TWCT22. 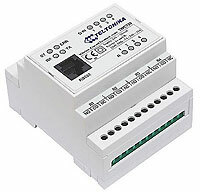 The inputs present on TWCT22 can be used for monitoring of external devices or connecting sensors (analog/digital). Alarm conditions can be configured for monitoring of these inputs. Since TWCT22 supports SMS and SMTP protocols, the device can be configured to send SMS/Email whenever alarm conditions occur. TWCT22 also gives you the freedom to control the states of the connected outputs. By sending a simple SMS you can change/get the status of the outputs. Wide coverage of GSM networks and the provision of GPRS connectivity have made it possible to interconnect systems wirelessly. TWCT22 exploits the benefits of this wireless technology and gives you control of your remote units from any part of this World. All-in-all TWCT22 is an advanced, effective and an economical solution for fulfilling your needs of remote monitoring and control applications. Surge and reverse voltage protection on all the inputs. Download SECURITEX TWCT22 SERVER 705 (APPLICATION)-This exe file is safe to download and install on your PC for use on TWCT22.